LifeNets identifies well-managed, self-sacrificing, accountable efforts to help disadvantaged people in their own countries. Dunya Orphans School is one of them. We are happy to lend a hand up to those who operate a school to help their own orphans. 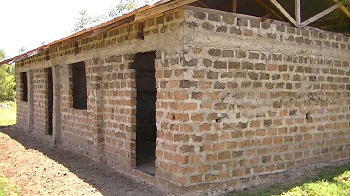 Here is a new photo of the completed Dunya Orphans School building at Kosele, Kenya. 70 students including many orphans were present for the photo. We made our goal of raising $6000 with a few extra generous donations in the past week! We thank everyone who has stepped up and wanted to see this school for orphans take place. As soon as we can we will have a progresss report and photos. 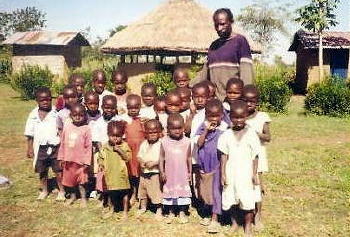 Kosele Dunya Orphans school is operated by Joseph Onura. He has provided for widow projects as well as the school for the orphans. 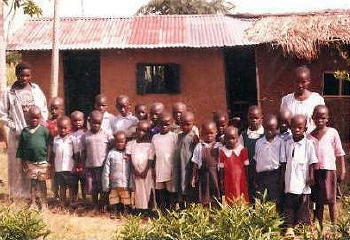 The school has 56 orphans, 32 of them are total orphans, meaning they have lost both parents. Concerned individuals in he United States have been providing about $100 a month in aid for them which goes towards school supplies and providing a meal or two per day. Jim Morgan of Tennessee and Merrie Elliott of Arizona have been instrumental in fund raising for the school. I appreciate the love you have shown to me, our orphans and our unfortunate children. Again I thank you for the support we have received for the project, may God bless you and the work you are trying to do. I am very happy with the supply of $600 every six month to go towards the school supplies, salaries and food expenses for the children and staff. We have seen a great change in the school because of food, our children are very happy and enjoying breakfast and lunch all the time in school. We need to construct classrooms, latrines, buy chairs, tables, school uniforms and construct water catchment project to supply clean water. A year later, in 2011 a donation of $800 went toward a hand dug well with the remainder going toward a very much needed building. At this time we're at the point of wanting to make a capital move to provide the much needed building. I was at Kosele recently where by I went to see the progress of the School building as at now, we found that they were able to construct two classrooms and the already put on the roofing and just waiting for the plastering and window/doors fittings, so the funds that were available were able to do the work up to where it is, as you can see the photo attached. We will be very happy to receive additional funds to help them complete the building. As of this writing on February 29, 2012, we would like to state the following needs and appeal. Dunya is a small, remote community in Western Kenya that is comprised of a population struggling with AIDS. Orphans and single parent children living there often struggle to find food prior to reaching the age where government run education starts. A small group of widows and adults have been running the Dunya Widows and Orphans Project which provides area preschoolers with a daily meal and a kindergarten education. They plant and raise crops with which to feed the children as well as teaching them to read and write. They built simple mud structures which have proved to be inadequate in size and quality to meet the children’s needs. 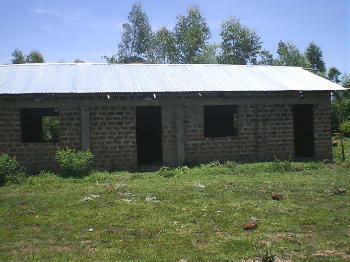 In 2010 they requested assistance to build a suitable classroom building on site. The amount of food required to feed the children exceeds what they are able to produce themselves through manual planting, cultivation and harvesting methods. The children have no desks to sit at and lack books and writing materials. The teachers lack the teaching tools needed to give the children a complete Kindergarten education. In 2011, matching funds from LifeNets doubled a contribution by a UCG Phoenix Women’s Weekend event for the construction of a classroom facility at the orphans school in Dunya, Kenya. The building is in the “dried-in” state with rough walls, openings for windows and doors, and a sheet-metal roof. The Dunya Widows and Orphans Project requests funds in the following amounts for the purposes defined below. $4500 for plastering, cement floors, security windows and lockable doors. $1000 for desks, chairs, books and teaching materials. $500 for farming implements to assist them in providing food for the children.